This is a great article – ‘How to be German in 20 steps. It is very funny and indeed very true and I highly recommend reading it. The author has just published a longer version which is in both English and German in one book. A good xmas present for anyone trying to figure out the German culture. One of the things I miss most here is not being able to read magazines. So I was excited when Cheryl gave me a great tip about how libraries are now lending out magazines on-line (using a service called Zino). The magazines can then be downloaded onto a Kindle or ipad and you can keep them forever, plus often download back issues too. So it’s worth checking to see if the library in your hometown has Zino – for example Edinburgh and London in the UK, Denver and Boston in the US and Toronto in Canada all offer them. Or you can pester your relatives & relatives to lend you their library cards 🙂 And of course most libraries offer e-books which is a great way to stock up on English titles. Today marks the start of the Christmas season for us here in Finland. A bit of decorating, cookies, and mostly Christmas music and Glögi ( a type of Glühwein Nordic style). All this got me thinking about Bielefeld and the great German Christmas markets. What I love about the Christmas markets in Germany is that everybody goes, every evening, by the looks of it. Christmas market is not only a place to purchase presents and crafts, but a place to meet up with friends. And drink and eat. It is so easy to eat out as there is lots of choice and it’s fairly cheap as well. We had three Christmases in Bielefeld and had a bit of a tradition budding. A night at the market with the kids and friends, meeting place ‘the talking elk’s head’ near the church at the Altstadt. Be warned, the place is FULL! 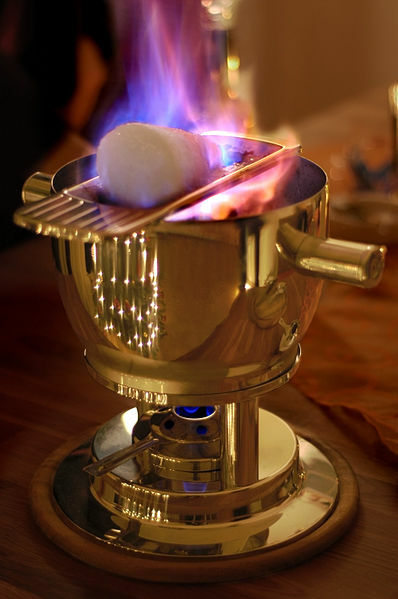 On the drinks front my favourite is the very sweet and strong Feuerzangenbowle which is made of rum-soaked sugar-loaf and mulled wine. It’s just the best thing in a really freezing winter night, bearing in mind that it is strong! And sweet. Well worth the try though. I also visited the Berlin Christmas markets one year with my sister. That was great, as we navigated through Berlin following various markets refueling in each of them 🙂 Curiously I don’t remember feeling cold once on that trip although it was very tough winter in Germany apparently.